Berthelot Hotel was opened 8 years ago in Bucharest, with an uncovered outdoor terrace used only in the hot weather. 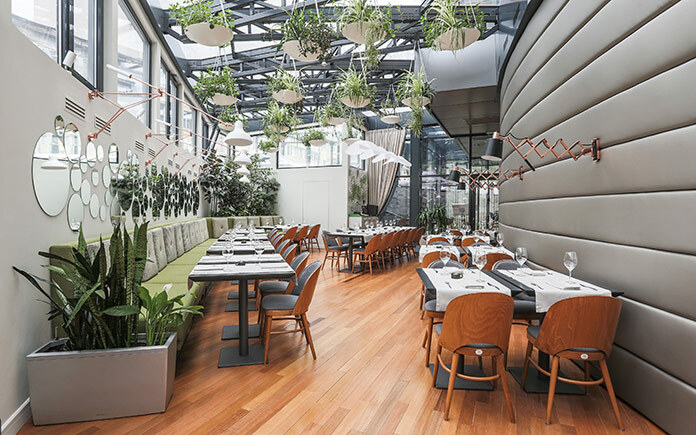 In time, the hotel felt the need to enlarge the restaurant area and explored the possibility of using this space to appeal to more than just the hotel guests. At the end of 2014, the hotel owners initiated a project to cover the terrace with a glass and metal structure. This has been designed so as to allow maximum natural light creating a modern, bright space. “The concept I presented was that of “Hanging Gardens”, introducing an element of abundant natural vegetation to balance the amount of glass and metal used to cover the terrace. 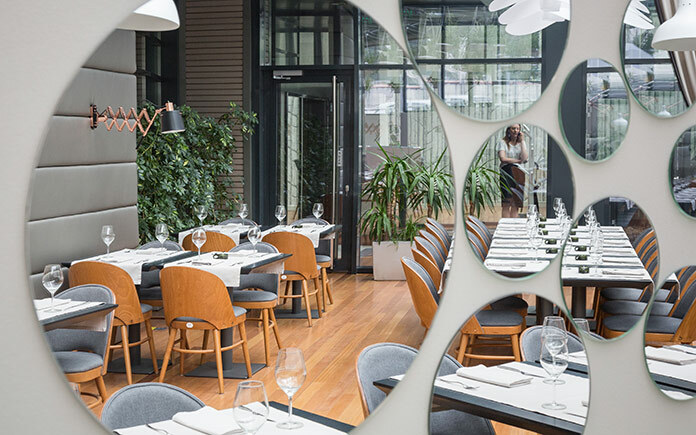 I wanted to create a verdant interior, resembling a green house, a harmonious and comfortable restaurant where customers could feel like they were in a spring garden.” – Alexandra Zabunov Henry, interior designer. 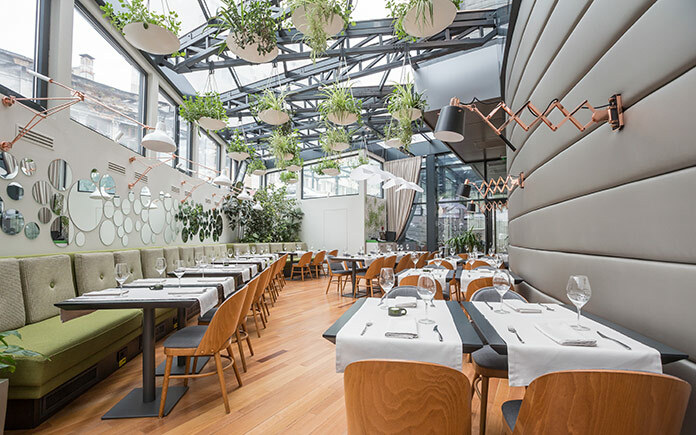 Forty flower pots made of powder coated pressed steel were filled with vegetation and suspended from the roof metal structure – these pots and their fastenings were custom made especially for this project. A corner garden behind the sofa completed the picture of a green terrace. Moreover, the organic approach using fluid curvaceous shapes was continued in all details and interior fittings, in order to contradict the rigor of the metal structure. The sofa follows the shape of the wall and was also custom made after a thorough survey and the two tone green fabrics completed the picture of a natural terrace. 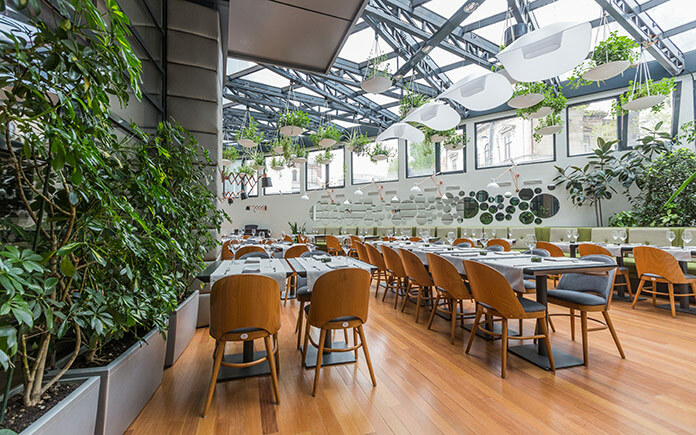 The large areas of glass resulted in acoustic problems, something that is particularly important in the public space of a restaurant. This was solved with a wall padding and the addition of sound-absorbing materials, in the sofa as well as installing a curtain at the entrance. The padded wall replaced the building ventilated façade system and in this way the outer wall of the hotel was visually transformed into an interior wall. The image of raindrops on the glass surface of the roof inspired the idea of the round mirrors mounted on the curved wall above the sofa and these were visually transposed on the wall at an exaggerated scale. As a result or natural light flooding the space, the covered terrace is a perfect place for a breakfast and lunch time. However, dinner time requires a special ambience, so Alexandra thought of an atmospheric lighting scheme using DelightFULL’s wall lamps with long adjustable copper arms, descending over the tables. The rhythm created by Diana Wall Lamp‘s slender shapes enriches the design whereas the soft spotlight gives the desired effect of a sophisticated ambient. 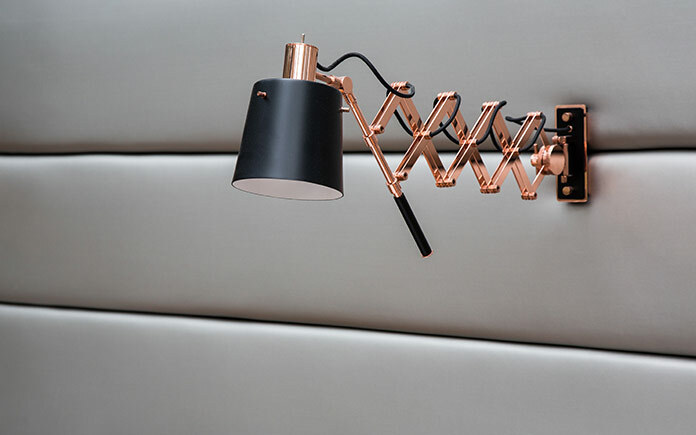 The scissor arms of the Pastorius Wall Lamp, which was, in fact, mounted on the padded wall, above the tables, allowing the guests to direct the light as they feel comfortable. The possibility of customizing the colors and the materials of the lamps allowed the interior designer to create a coherent color scheme throughout the space. “I feel instantly in love with the scissor arms of the Pastorius Wall Lamp, and I had to have this piece in my project”, said Alexandra Zabunov Henry.